Are you dreaming of revamping your home? Creating something a bit larger, more modern and maybe even a bit more fun? A home is an escape from the busy working environment, and therefore should include all the comforts that fits your lifestyle. No one wants a home that was last decorated in the 1950’s, of course a rustic or vintage look is appealing, but this often means new appliances and some modern touches have been included to purposefully create this style. 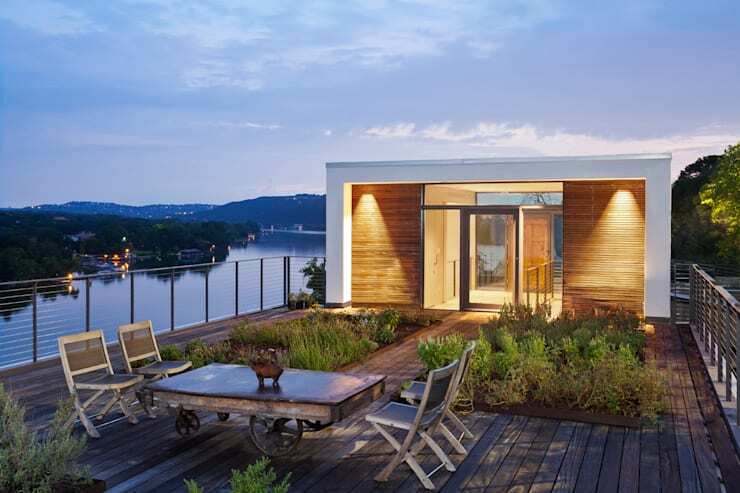 In this edition of homify, we journey to Austin, Texas in the USA, where this fantastic remodeling project on the shores of Lake Austin, created an awesome home experience. Originally built in the 70’s, this home was completely renovated by the team at Specht Architects. And taking into consideration the potential of the space as well as the desires of the new homeowners… the expert team integrated the beautiful natural landscape into the design, to the delight of the owners. It’s modern, stylish and trendy, with a touch of rustic charm! Everything we adore! Our first glimpse of this amazing home is the terrace. A space to relax and unwind enjoying the crisp fresh air overlooking the gorgeous lake below. This garden terrace with comfortable wooden deck, creates a stunning space to enjoy the view of the landscape at sunset. Just imagine how relaxing this terrace will be with great company and delicious cocktails on a warm summer evening! This large living room drenched in natural sunlight, and adorned in a combination of rustic and contemporary furniture is the perfect fit for this modern loft style home. The warm and vibrant colours of the rug and sofas creates a personal touch to this interior, while the wooden floor enhances the cosy feeling, making this comfortable living room attractive and inviting. The floor to ceiling windows and glass sliding doors allows for fantastic views of the beautiful lake from the comfort of the balcony, while allowing this interior space to seem almost cut off from civilisation, but in a good way! This shared space between the dining room and kitchen is the revival of an old trend, being a dinner host with family and friends, no longer means slaving in the kitchen away from the laughter and conversation. In fact, it's more fun to be surrounded by loved ones while preparing a delectable meal. The dining room table is quite large and therefore seats a comfortable amount of guests. But, the decor of the dining area is very different to that seen in the kitchen and even the living room, where rustic ideals were recreated… the dining room is ultra-sleek and modern, with glass and metal adding sophistication and elegance to the room for a contrasting effect. 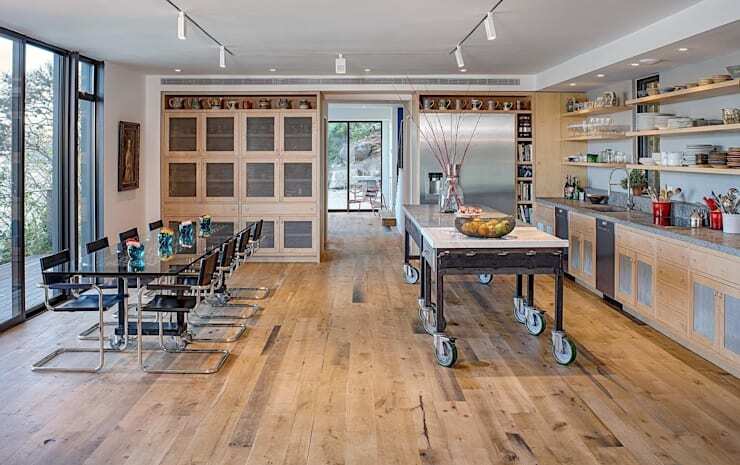 This modern and rustic kitchen is spacious and functional. 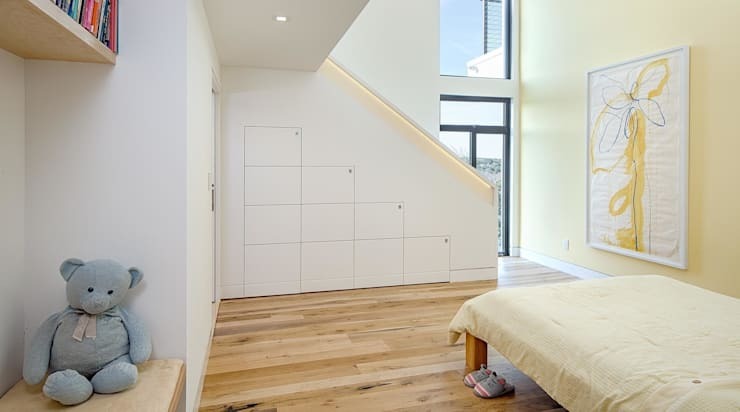 The addition of wooden cabinets and flooring creates a pleasant element that is both cosy and welcoming. The storage space was well-planned with appliances integrated into the design, while rustic wooden shelves along the wall, and creates a wonderful storage solution for crockery and items needed regularly for cooking. 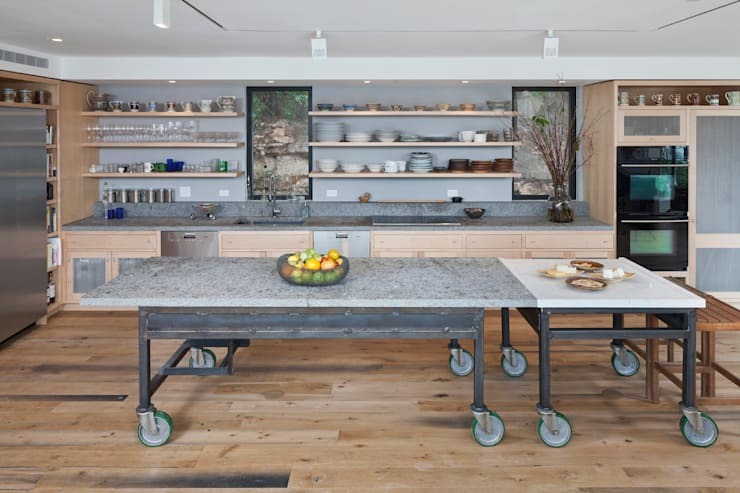 A table on wheels separates the dining area from the kitchen, and also serves as a working space to prepare meals on. If you require more seating space for guests, then simply add some chairs and you will have a secondary dining table! A master bedroom should always be the most fantastic and stylish space in a home, it's a solace… and escape from work, family and noise, which is why a master suite must resemble a designer hotel bedroom. A room featuring quirky and charming ideas, using soft colours to a romantic appeal! This fantastic bedroom design makes use of rustic materials to enhance the elegant environment, the addition of iron, glass and wood adds to this charm, while the feature wall in pastel green creates a space that is appreciative of the outdoors! 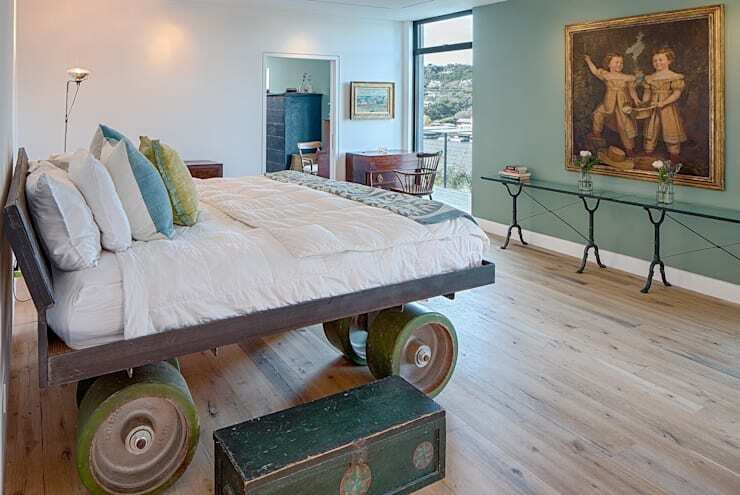 What do you think about the bed on wheels? So innovative and funky! For tips on creating a more romantic bedroom, have a look at this Ideabook: How to make your bedroom more romantic. A guest bedroom is a great space to have, especially when it's a bit too late for family and friends to head home after an awesome evening celebration. It should be decorated in a cosy and simple atmosphere with timeless elements included in the design. This room is decorated in neutral tones and soft colours to enhance the relaxing ambiance, while remaining sophisticated and refined in its layout. The bedroom is neutral and classic and can appeal to any visitor! What are your thoughts on this rustic and modern home design? Do you think rustic and modern go well together? Tell us your thoughts!